NASA’s fledgling Wide-field Infrared Survey Explorer (WISE) opened its eyes a few weeks ago, and astronomers have just released the first of a torrent of spectacular images from it. Since its launch last December, WISE has been surveying the sky, taking data continuously as it spins on its axis and orbits the Earth. A few images have been released before, but these new ones are fully processed, scientifically-calibrated, and gorgeous. Holy dirty snowballs! That’s gorgeous, a classic comet. When this image was taken, on January 10, 2010, the comet was 340 million kilometers (200 million miles) from Earth. That’s a good ways off, so I’m impressed with the detail of this image! It’s actually a four-color image: blue is 3.6 microns (about 5 times the reddest wavelength the human eye can see, so well out into the infrared), green is 4.6, orange is 12, and red is 22 microns. Since the temperature of an objects determines the kind of light it emits, we can estimate the temperature of the comet just by eyeballing this picture. It’s mostly orange, meaning the comet is pouring out light at 12 microns. A human being radiates infrared from about 7 to 14 microns, so this means the parts of the comet emitting IR (and therefore seen by WISE in this image) are around the same temperature as a person! Well, in physics terms; in human terms it’s pretty cold, about -40 Celsius. And it’ll get even colder now since it’s on its way out of the inner solar system, away from the Sun’s warmth. It’ll dim as it cools, too, returning back to invisibility once again. WISE is expected to see quite a few comets, and in fact discovered its first just a few days ago. I wonder how many it’ll find, and if they’ll all be this pretty…? Recognize that galaxy? I wouldn’t blame you if you didn’t, but it’s Andromeda! That’s the nearest large spiral to our Milky Way. It’s roughly 2.9 million light years away (estimates vary) and can be seen by the naked eye from a dark site. This stunning photo really accentuates how amazing WISE is: the field of view is 5 degrees across, the width of ten full Moons. The Hubble camera I used to work with would barely cover a pixel in this image! Remember, this image is all infrared. What looks blue here is actually cold stuff compared to what we’re used to: old red stars, for example. The colors are a little different than in the comet image, but red is still the coolest material: dust. 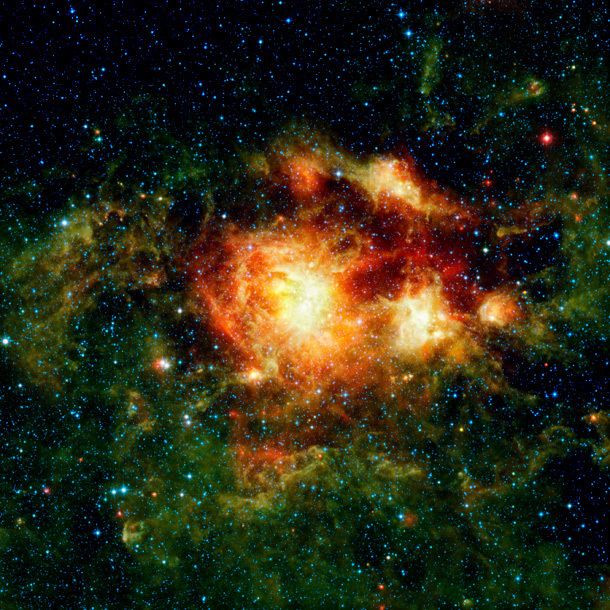 These complex molecules are created when massive stars are born and when they die. Since massive stars don’t live long, they tend to die near where they were born, so you see the dust constrained to very narrow areas where star formation occurs. Less hefty stars (like the Sun) live long enough to drift away from their nursery over billions of years, so they fill the galaxy’s disk (in blue). That’s why the dust is so vivid and tightly defined in this image. If you look closely, you can see the left side of the galaxy is a bit distorted. That’s called a warp, and is probably caused by a nearby pass of another galaxy, or one Andromeda actually absorbed. The fuzzy blob just below the main galaxy is a dwarf elliptical companion to Andromeda, orbiting it like the Moon orbits the Earth. It’s mostly composed of old stars that look red to our eye, so again it’s blue in this false color image. It may not look familiar, but if you’ve been reading my blog for more than a couple of weeks, you’ve seen it: I wrote about a Hubble image of this very nebula. Now, if you’re like me, you’ll click that link, look at the Hubble image, and then try to figure out where it fits in this WISE shot. Pbbbt. Don’t bother. The Hubble image is only a tiny portion of this vast vista, a blip right in the middle of the brightest part of the WISE image. The S in WISE is for "Survey", which means it takes pictures of ginormous swaths of sky, far more than Hubble can do. In fact, Hubble could take picture after picture for weeks and not get a view of the sky as large as WISE does in a few minutes (of course, the Hubble image would be a whole lot more detailed…). In this image, as before, red is warm dust, and blue is hotter material like stars. The green is what gets me though: at 12 microns, that reveals PAHs, polycyclic aromatic hydrocarbons. These complex organic compounds form in cool conditions in nebulae, which are lousy with them. They’re everywhere where the temperature isn’t too high to disintegrate them. They can form even larger molecules, and some people think they may be important in creating the molecules necessary for life on Earth. That’s not to say those molecules form in nebulae like NGC 3603 and then somehow get here; they most likely form right here as well. The point is, they look like they’re pretty easy to make if conditions are right… on Earth as it is in the heavens. And the sheer size and breadth of the nebula is simply stunning! I’m so used to narrow fields of view that I forget sometimes just how large these objects are. This nebula is dozens of light years across, forming thousands upon thousands of stars. It’s among the biggest such star factories in our galaxy, and is certainly easily visible from other galaxies as well. Even from 20,000 light years away — 1/5 of the way across our entire galaxy — it’s clearly a formidable object. And that’s the strength of WISE. It can see large objects, investigate the bigger picture of the sky, and do it in the longest regions of the infrared spectrum, light that we simply cannot explore from the ground — our air absorbs it, and all the warm objects around us glow fiercely at those energies. It would be like trying to find a firefly against the Sun! So we must launch observatories into space to peer at the far infrared light from cosmic objects, and WISE will be our eyes to do just that. And from these images it looks like it’ll do a fine job. I’m impressed with these images. I’ve seen a few early release observations in my time — I’ve made a few myself! — and these are excellent. The whole mission is only supposed to last a few months; there is coolant on board for the detectors that can only go so far. In that short time it has a whole sky to observe, and that’s a lot of space. But that also means there’s a lot to see: galaxies, asteroids, comets, nebulae… maybe even a gamma-ray burst or two. The next few months will be very exciting for infrared astronomy!